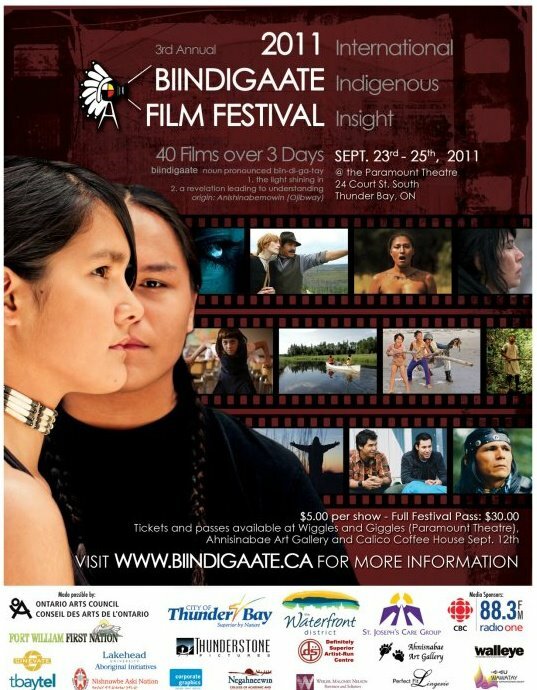 ‘Two Indians Talking’ is happy to announce that we will be the closing film at the 3rd annual Biindigaate Film Festival in Thunder Bay, ON, running September 23-25, 2011. Building on the tradition of sharing knowledge and telling stories, the Biindigaate Film Festival is a celebration of indigenous films and filmmakers. ‘Two Indians Talking’ screens at 9:00 pm, Sunday September 25, 2011 at the Paramount Theatre, 24 Court St S, Thunder Bay, ON. The full program of inspiring short and feature-length films, and ticket information, can be found online at www.biindigaate.ca.